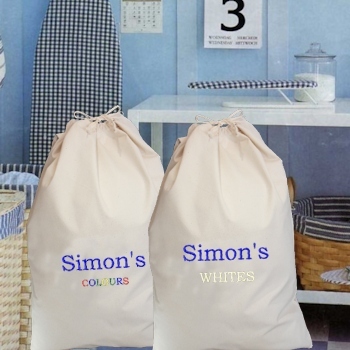 Pair of extra large canvas Laundry Bags with bespoke embroidery for helping to sort your white clothes from your coloured clothes. Pair of extra large canvas Laundry Bags with bespoke embroidery for helping to sort your white clothes from your coloured clothes. A tidy storage solution for around the house and handy for taking clothes to be laundered. We will professionally embroider a name, nickname, house name/number or postcode personalised onto each sturdy natural cotton canvas drawstring sack. We will professionally embroider a name, nickname, house name/number or postcode personalised onto each sturdy natural cotton canvas drawstring sack. These giant sacks are very good quality and measures 60cm wide by 76cm in height and will hold lots of clothes. You get two sacks - one for your White clothes and one for your Coloured clothes. Please enter the personalised text you would like embroidered. Beautifully sewn in a thread colour of your choice to make a unique bespoke clothes sack. The word WHITES is sewn one one sack and the word COLOURS is sewn onto the other sack.